On listening to the word ‘bridge’, we all form an image of a well structured iron bridge in our minds. But ever heard of natural bridges? Well here’s an interesting example of a natural living bridge. Cherrapunji, a town in North-East India, which is known to be the second wettest place on earth, is also known for its living bridges. Here the bridges aren’t built but grown. 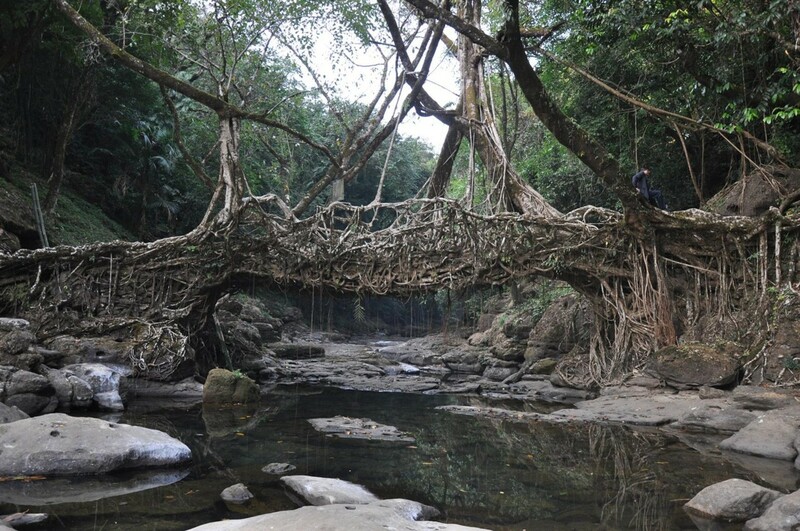 The living bridges are made from the roots of Ficus elastica tree whose secondary roots grow above the ground surface. Long ago, War-Khasis, a tribe of Meghalaya, used this tree to cross rivers. Using the same technique, villagers of Cherrapunji grow their own bridges whenever required. The villagers have created a root-guiding system that forces the tender roots of the rubber tree to grow straight. Such roots make a strong, living bridge in about 10-15 years. Unlike the conventional man-made bridges which grow weak over time, these living bridges gain strength over time. Some of these bridges are more than five hundred (500) years old and can support 50 people at a time. A unique bridge called Umshiang Double-Decker Root Bridge is believed to be only one of its kinds in the whole world. It is actually a combination of two bridges, one stacked on top of the other. Previous article Finding Hard To Recall Your Dreams? Now Simply Record Them!